A few months back a friend of mine called up to tell me we were going to London. Seeing as I’ve been an expat living in Europe for several years now, I’ve had many an opportunity to visit the British capital. I’ve always had the best of times, but, when she first told me, I was a bit disappointed. I’m an avid traveler, so returning to destinations can sometimes feel like a wasted opportunity to visit somewhere new and mysterious, full of exotic and novel experiences. But after such an incredible weekend, I can hardly think how I could have NOT wanted to go back to London. This was my friend’s first trip there, so we had to hit all of the big sites, but also made time for new culinary experiences for me to revel in. Tip: If you want to know more about a topic or place click on the embedded links! 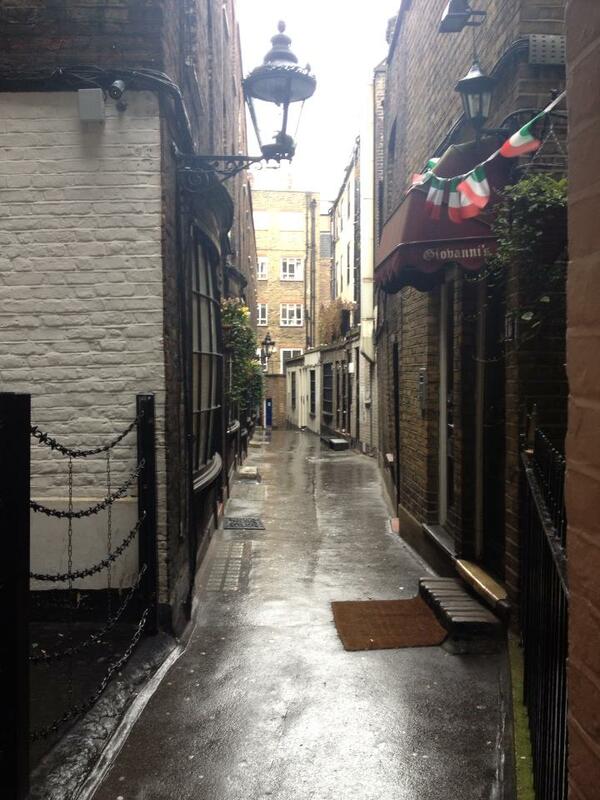 We got in mid-afternoon on a Saturday and made our way from Heathrow, via Tube to our guesthouse in Covent Garden. Since I was already familiar with the city, this made a ton of sense. Guest houses are the perfect option for people who don’t need to be reliant on a concierge or front desk staff. The room was great, and I’ve never stayed more centrally. Our first stop was the Lamb and Flag, only a few paces from our lodging and right near the Leicester tube stop. The Lamb and Flag is one of the greatest examples of a traditional pub I’ve ever encountered. Located on an alleyway in the heart of Covent Garden If you try and find it by going down Rose Street, you’ll ask yourself if it’s even a street you’re going down, less than six feet high and barely wide enough for one. Once you get inside you’re met with hard woods, bar stools, and beer taps, which take you back to every image of a pub you can summon up. We made our way upstairs, out of the dreary London rain that had greeted us upon arrival, to the dining room, where we met a friend of mine stationed outside the city, and sat down for some killer pints of London Pride and some steak and mushroom pie with veg and mash that couldn’t have suited the moment any better. After that we made our way through the stereotypical London drizzle to Trafalgar Square to admire the sights as best we could, given the weather. And eventually took shelter in yet another classic pub for a glass of Lagavulin. Worn out from a long day of travel, we went for a great cookie dough lava cake with a couple nice glasses of Sangiovese at Bella Italia, before calling it a night. I’m not usually a big fan of waking up early in the morning, but when on vacation I always make a point of taking full advantage of my time. Luckily, we woke up to significantly improved weather, which made it much easier to roll out of bed and down to the neighborhood Starbucks. 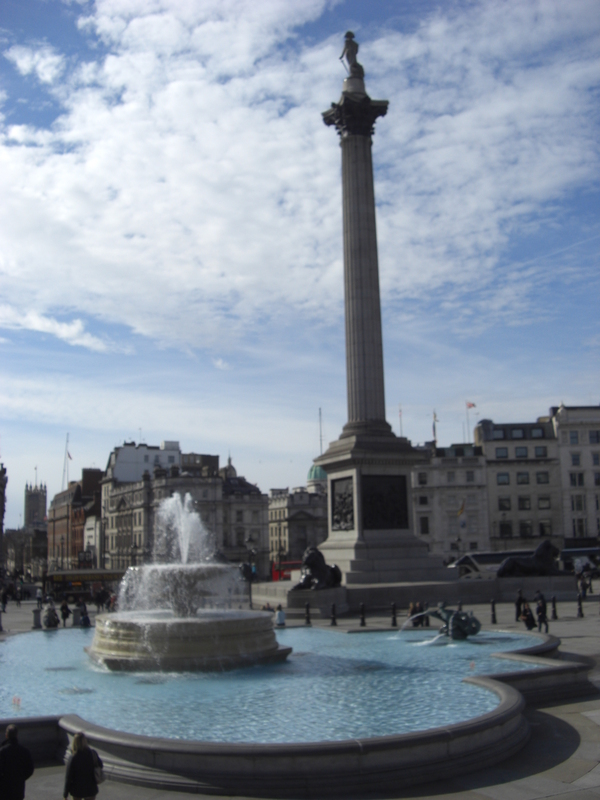 After getting our morning caffeine requirements under hand, we made our way back to Trafalgar Square for sunny pictures of Nelson’s Column and the National Gallery, and caught our first glimpse of Big Ben in the distance. It had been too dark and stormy the day before to make it out. The moment you see that one most iconic of monuments in a city is when you really feel like you’re there and the trip really comes into focus. 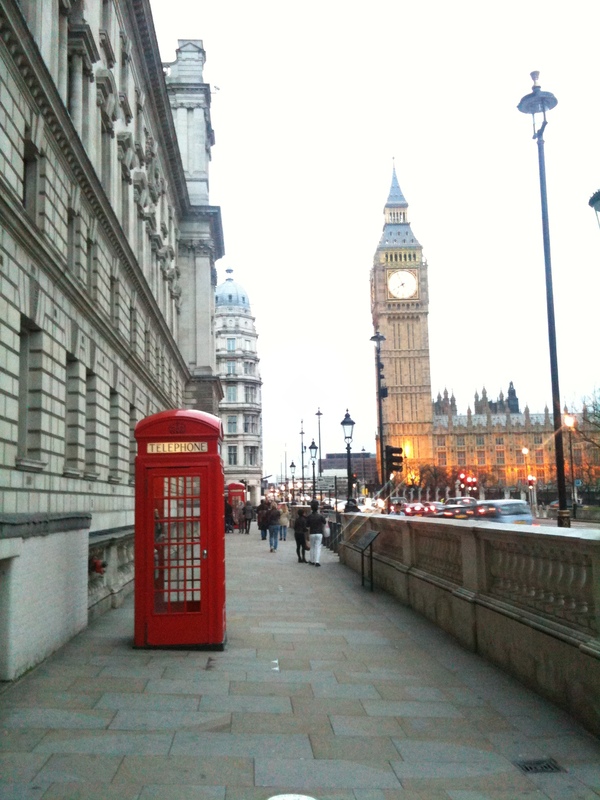 And, when it’s London, for me, it really makes me feel small and large all at the same time. You feel your place in the world in all its grandeur, and at the same time you feel a participant in it, a real citizen of the world. 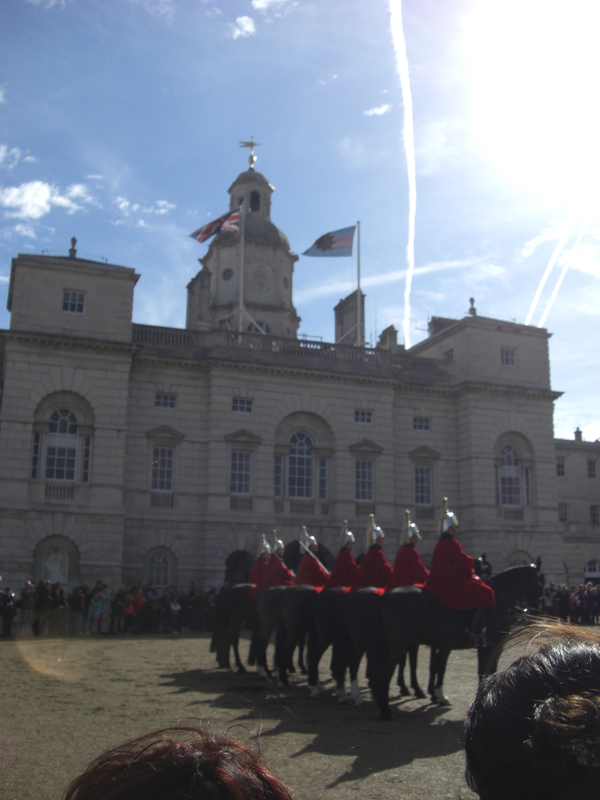 After the photo op we decided to walk towards Buckingham Palace and in doing so stumbled across the Horse Guards’ Parade. We stopped for a bit to see the show and then continued on our stroll through the wonderful Royal Parks. I’ve never known any similarly bustling city to have such incredible parks; it really is incredible. You could walk for hours and hours through them, passing people doing sport, or walking their dogs, or just reading on the grass a while. We went along the Mall by Saint James Park, passed by the Victoria Memorial and Buckingham Palace, through Green Park and under the Wellington Arch, and along Park Lane into Hyde Park. There are few places better to be on a sunny Sunday morning than meandering through Hyde Park, so full of people enjoying themselves, yet tranquil and relaxing with its never-ending green lawns. We only had time to walk up the western length of it, but with more time one could spend hours enjoying its diverse flora and fauna. We went up to Speakers’ Corner. Unfortunately, you have to be there on a Saturday to catch all the crazies on their soap boxes, so we decided to stop for a much deserved midmorning break. Part of my travel philosophy is grazing: making frequent stops to take in the liquid and edible culture of a place, and if there’s a little people watching to be had, then for me that’s the best travel experience I could dream of. So we decided to get off the main drag and discovered the Grazing Goat. Since even its name fits my philosophy, we couldn’t have found a better place. We had a Mimosa and a Bloody Mary, but the food looked great too! Recharged and ready to push on, we went ahead to Oxford Street, and after a little shopping at Top Shop , we decided it was time to head south of the Thames . Hopping on the Tube at Oxford Circus, we opted for the Day Travelcard , which ended up being a huge savings and great convenience. 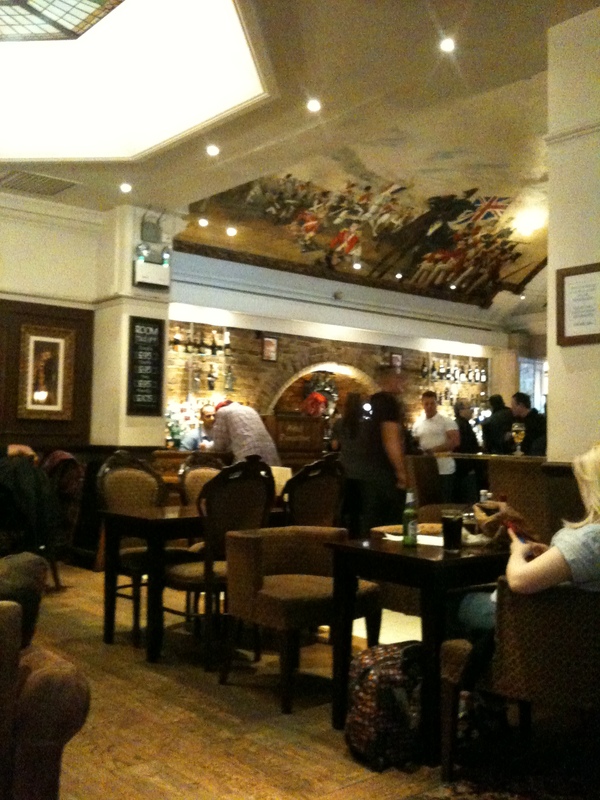 Emerging on the Southbank, we went for lunch at The Wellington at Waterloo which is a great historic pub and hotel with an incredible painting of the battle of Waterloo on the ceiling. The next thing to do was hit a museum! 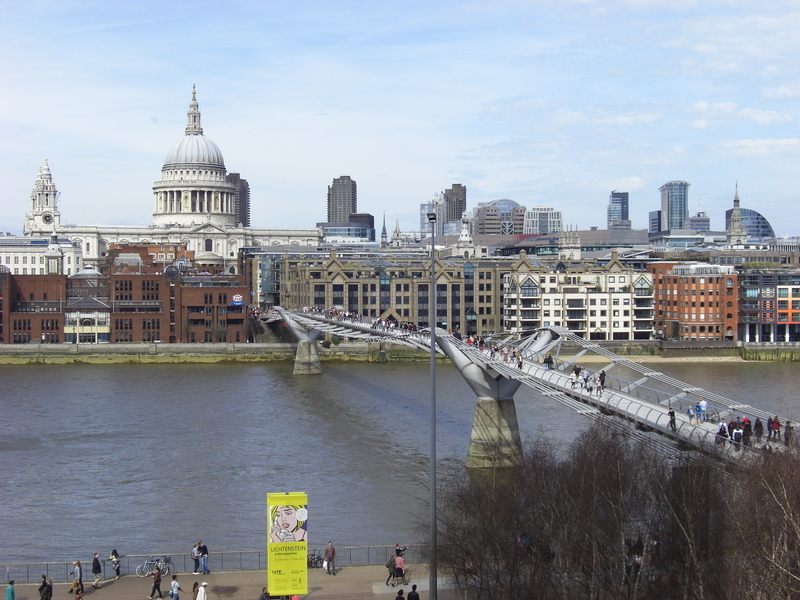 So we ambled over to the Tate Modern and spent a while looking at the collection and taking incredible photos of Saint Paul’s Cathedral across the Thames. On our agenda for Sunday afternoon was one of the big highlights: afternoon tea! 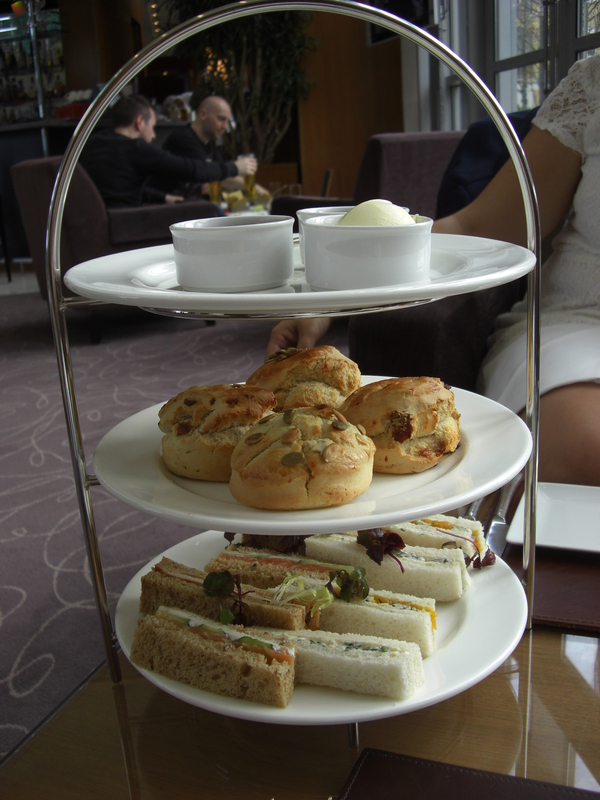 Our tea reservations were at the beautiful Four Seasons Canary Warf . We went for the Taittinger Brut Prestige Rose Champagne to accompany our tea. The unending chain of beautiful scones, tea sandwiches, Earl Grey, and decadent deserts was supremely apropos for the beautiful setting and superb service. It was the definition of excess, and absolutely the right choice for our Sunday afternoon pit stop. Having finished tea, we caught the Thames Clipper to the Tower of London. After that we pulled out our friendly bus map to find a route that would take us up to Parliament to catch Big Ben and Westminster Abbey at sunset. After a long day of sightseeing, it was time to start looking for dinner! 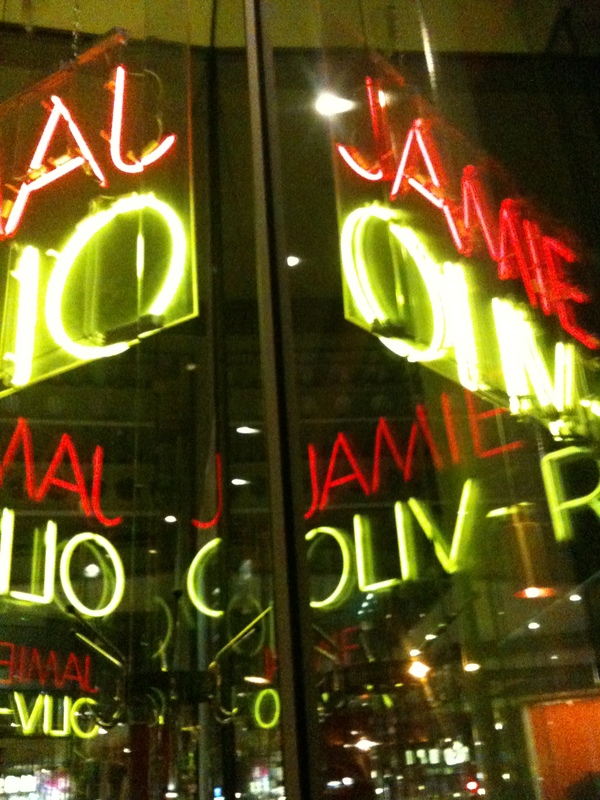 We hadn’t made reservations anywhere but had a few places we’d looked up, finally settling on Jamie Oliver’s Union Jacks, just a short ways from where we were staying. And what a great decision! From the long drinks, done with homemade sodas, to the oxtail pizza and the earl grey ice cream, everything was spot on; he perfect way to end a long day taking in London! 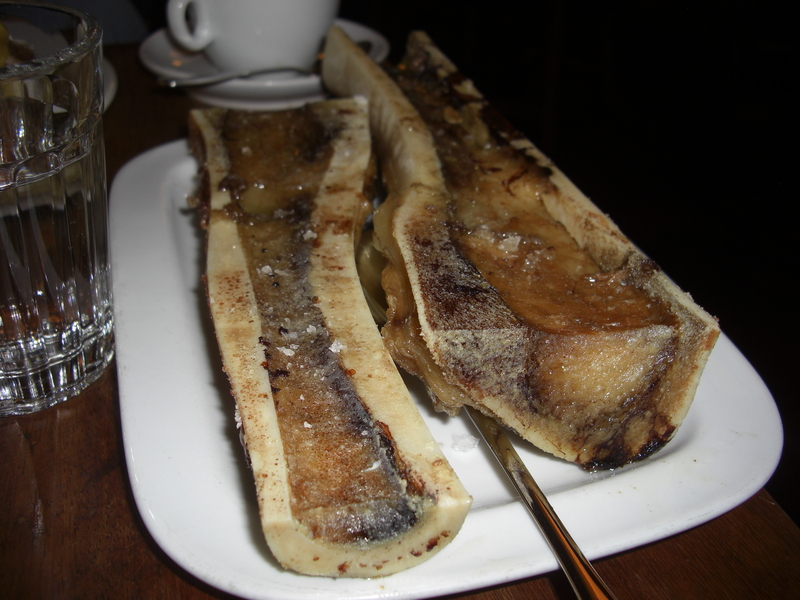 Our big English breakfast was scheduled for early, and luckily bright, Monday morning at the Hawksmoor at Guildhall. And of all the breakfast places I’ve tried out in London over the years, this was the king by far. The exuberantly friendly service and great food made it just the place we were looking for. My friend ordered Eggs Benedict and I went a little more native, ordering kippers with poached eggs and a side of beef marrow bones, for dessert we shared a stack of scotch pancakes. Everything was just stellar! Once quenched, we pushed on to King’s Cross Station for the photo op at platform 9 and ¾ , which was more or less on our way to Portobello Road. We spent a short time soaking in Notting Hill and looking at antiques before hopping a bus to Knightsbridge. As big as breakfast was, it was getting time to make another grazing stop, so we decided on Wagamama. I’ve often said I couldn’t imagine a trip to London without going to this go-to Asian fusion restaurant. After some Gyoza, Pad Thai, and Sake, it was time to move on to Harrods. 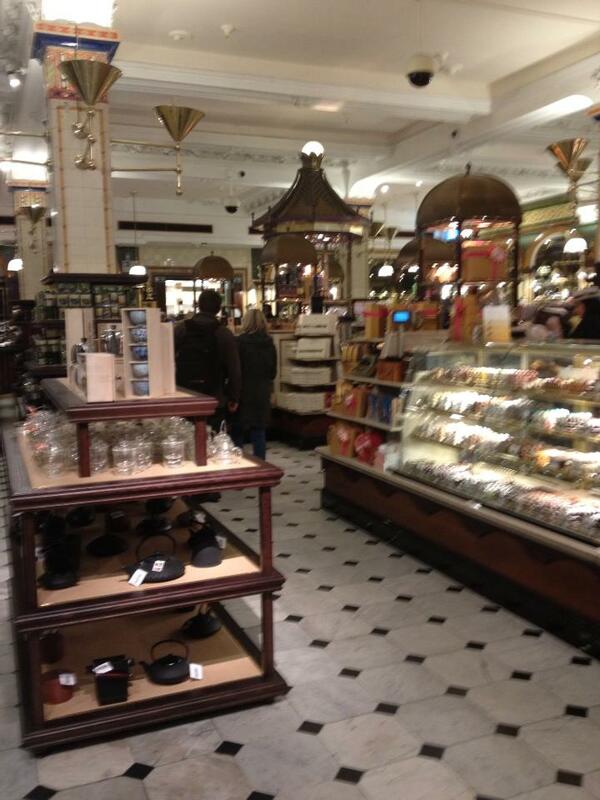 There are few shopping experiences as impressive as Harrods. The second you catch sight of it you feel the luxury its simple name exudes. As the foodie I am, the food halls are a must see for me every time I’m in town, so we started out there, where we stocked up on tea, gourmet chocolate, and a quick pause at the cheese counter for me to grab some Stilton and red Leicester cheeses to take back to Spain with me as a peace offering for not having taken my husband along with me on the trip. We went from there to the Egyptian Escalators, and up to look, and only dream of buying, in the shoe department, then on to lingerie, as I had under packed some essential items (woopse!). At this point the opulence was beginning to make me feel insecure of my socio-economic standing, so it was time to go. In anycase we had reservations at the Queen’s Theater to see Les Miserable, and needed to pick the tickets up. 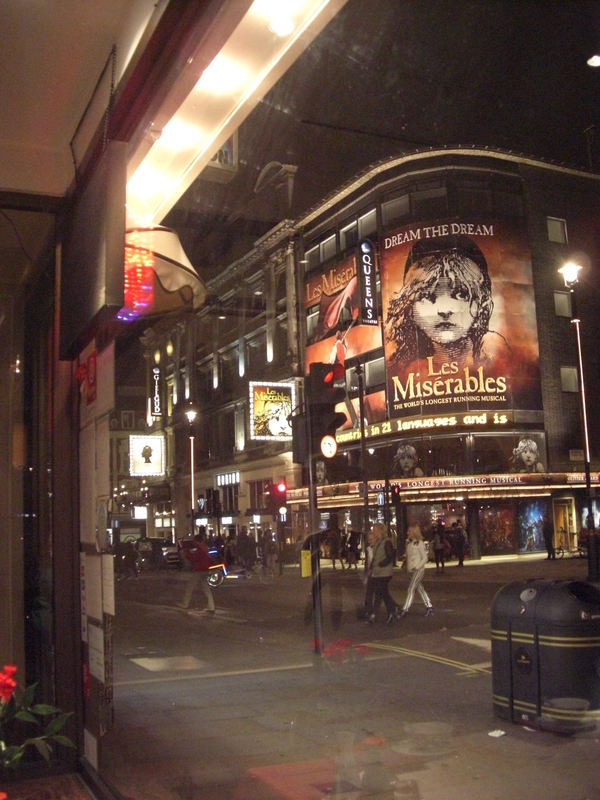 Theater is a big deal in London, as is evidenced by the plethora of half-price ticket shops and scalpers, but we bought ours online so we grabbed them from the box office and stopped off for a little more grazing before the show. Just up the street from the theater we found the St. James Tavern, where we ordered a wheel of fried Camembert, and a couple pints of cask ale, as well as some Bulmers cider. After a tremendous performance (I’m always a Les Mis fan, even before the movie! ), the next thing to do was explore China Town. We were pretty tired at this point so we went to the nearest Time Out recommended option, which was the New Mayflower. It was alright, I would probably try somewhere else next time. We ordered an appetizer plate (spring rolls, fried chicken satays, bbq short ribs, shrimp toast – which is the one thing that pleasantly surprised me, and fried seeweed) to share, and some TsingTao. It fulfilled our need to check off China Town, but little more. At the end of another jam packed day nothing is better than having the hotel just around the corner, which luckily we did! 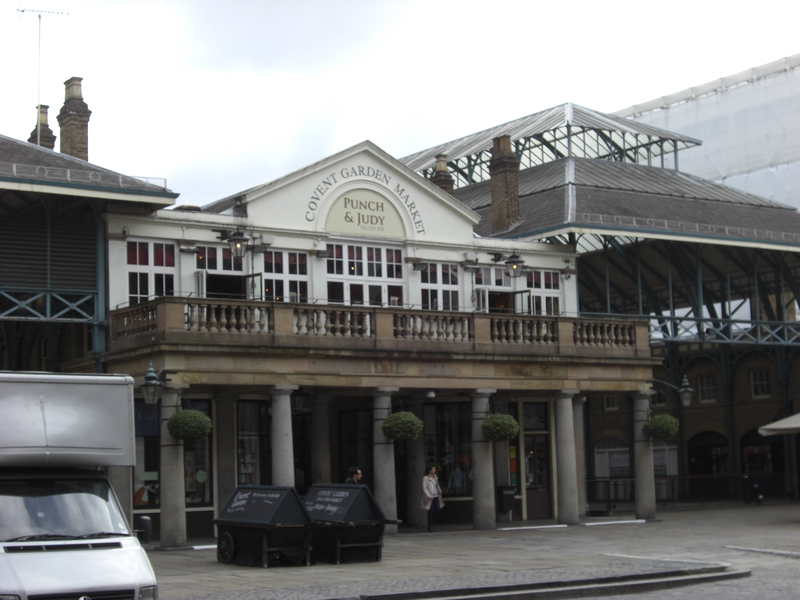 My last morning in London, we went to see Covent Garden before grabbing breakfast at Paul. Getting to the British Museum just after opening, we made a beeline to the Rosetta stone. 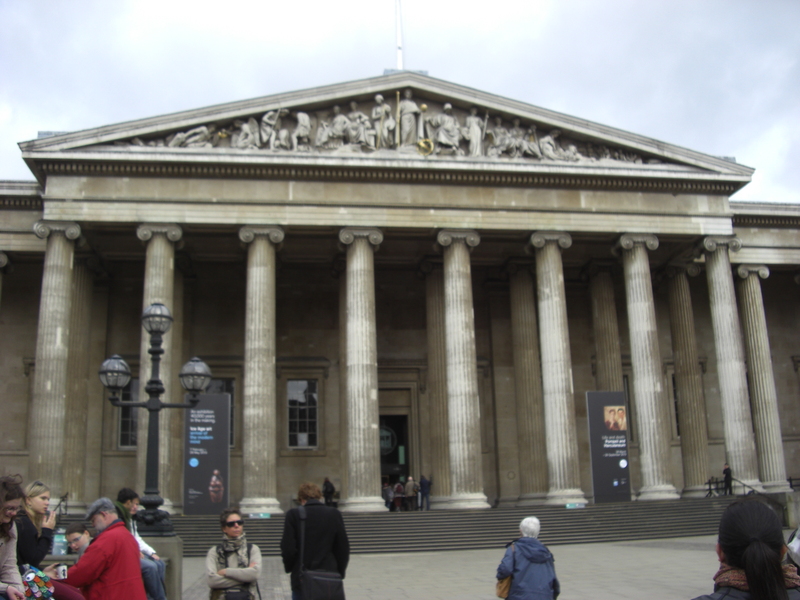 Then we made our way through their ancient collections, with true gems from everyone from the Egyptians, to the Assyrians, Myceneans, and winding up in the Greeks surrounded by the Parthenon frieze. 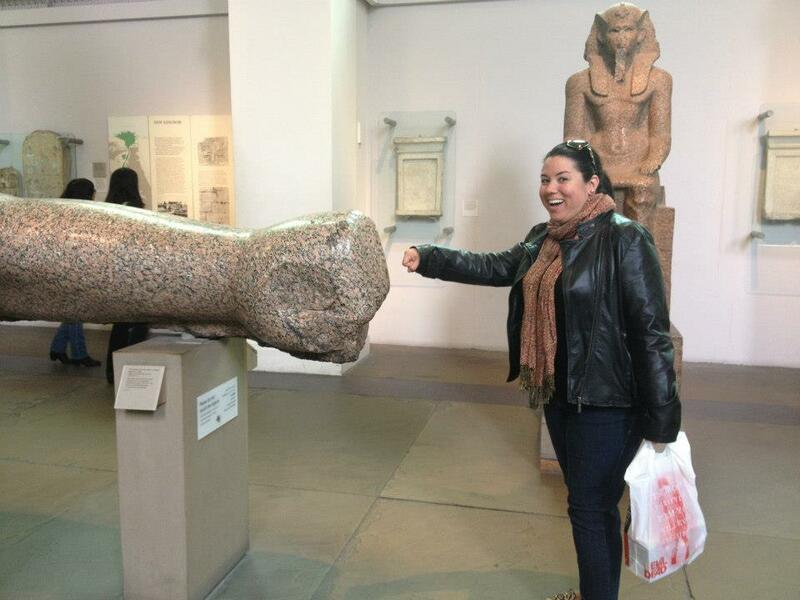 As history majors these collections are particularly fulfilling, but I think any time you’re confronted with the arm of an ancient Egyptian statue three times your size and thousands upon thousands of years old, it’s humbling and awe inspiring. Then we went on a little spree in the Museum Shop, because who doesn’t need a Rosetta stone iPhone case. We decided to retrace our steps and spend a little more time in Covent Garden and get some shopping done (I really had to have that Dr. Who themed transit pass cover!) before lunch. One can’t leave London without experiencing its Indian food. So we had made reservations at one that came highly recommended: Dishoom. It turns out I had actually researched this place for my last trip, but never got around to trying it out, and what a shame, because it’s incredible. We had the Blow Horn Spiced up cider and shared a number of small plates including some wonderful veggie samosas we ordered twice, and their signature Dishoom chicken tikka, which is an interesting take on the English national dish. We finished with a nice rose and cardamom lassie for “dessert.” Finally, it was time to head back to the Airport. I took advantage while waiting for my flight of doing a Johnnie Walker whiskey tasting, and took home a bottle of their Explorers’ Club the Spice Road, and grabbed some wasabi popcorn and sushi from Pret a Manger for the long trip home. And that was all she sung. Four days full to the brim with sight-seeing and gourmet adventures. 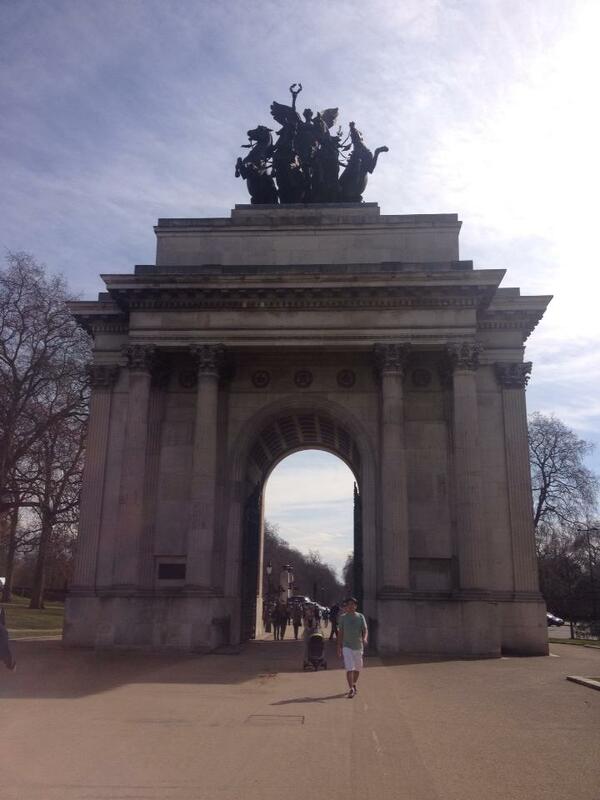 I think I fall in love with London more every time I go. Everyone jokes about how bad English food is, but I’ll tell you what: I’ve always eaten well when I’ve gone. Of course I’m a relentless researcher when it comes to travel, always looking up recommendations and reviews, and I suppose that makes a difference. But maybe my wonderful discoveries in this capital of European capitals can serve to help guide you on your own gastronomic adventures. 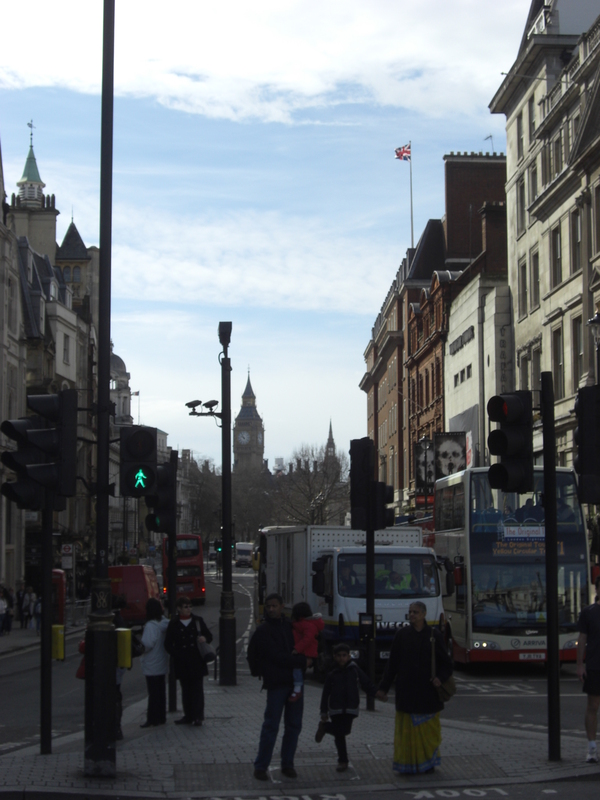 Be sure to check out our pictures from the great weekend we had in London!